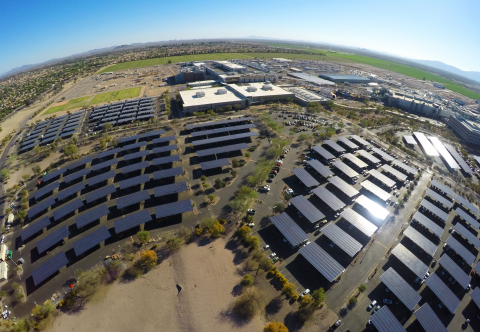 Intel has released their annual Corporate Responsibility Report, that discusses the company’s ongoing efforts to reduce its global climate and environmental footprint. One of the highlights in the report is the installation of nearly 3MM square feet of solar panels that help heat, cool, and light in nine different nations. That is enough solar panels to cover 52 regulation U.S. football fields. The solar panels harvest 33MM kilowatt-hours of green power, which is equal to the amount of annual energy used in 3700 U.S. homes. The energy is used to heat and cool Intel’s buildings, as well as provide lighting and electricity for the company’s campuses. 100% of the energy used by the company in its chip manufacturing in Europe and the United States comes from renewable sources. The company has been the No. 1 or No. 2 corporate buyer of green power in the United States for the last 10 years.